The BBC's flagship online TV service is being launched, offering viewers the chance to download their favourite programmes from the last seven days. For director general Mark Thompson, the launch of iPlayer is as big a milestone as the arrival of colour TV. But others have questioned how technically reliable it will be and whether it is late to a crowded market. At launch, a fixed number of people will be able to sign up, with the numbers increasing throughout the year. The iPlayer allows viewers to download a selection of programmes from the last seven days and watch them for up to 30 days afterwards. In the UK, Channel 4 offers a similar service, called 4OD, for programmes across its portfolio of channels. Viewers interested in the iPlayer can register for the service on Friday and will then be invited to join. The number of users will increase over the summer, before a full launch in the autumn. 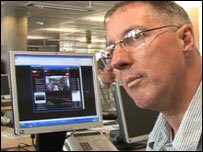 The iPlayer began life in 2003 as the iMP (Integrated Media Player), and some believe it should have been launched in that format. "At the time, it was remarkably innovative. 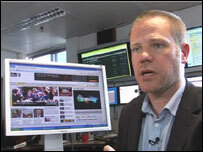 For the BBC to use peer-to-peer technology was revolutionary," said Simon Perry, editor of online magazine Digital Lifestyles. "If it had just launched it then it could have blown the whole broadcast world away. Who knows what the impact would have been if it had come out before the rise of YouTube," he said. Instead YouTube had driven a whole generation away from TV altogether, to get their entertainment and news from social networks, he added. A BBC spokeswoman said the iPlayer, like any other new BBC service, went through a Public Value Test (PVT). The nine-month test was overseen by the corporation's regulators. She said: "There is always going to be a trade-off between rigour and speed in a regulatory process like this. "The rigour of the PVT has actually forced us to scrutinise every aspect of the service, from design to value for money." Arash Amel, an analyst with research firm Screen Digest, said "technical glitches" were inevitable when iPlayer launched, partly because rival applications experienced them and partly through his own experience of the BBC's offering. "I have supposedly been on the trial for the last two weeks but there has just been technical fault after technical fault," he told the BBC News website. The iPlayer has already courted controversy from open source advocates, angry that, at launch, it will only be compatible on PCs with the Windows XP operating system. Other services such as ITV's broadband media player and Channel 4's on-demand offering also rely on Microsoft software but, critics argue, the BBC's remit is to serve licence-payers, which includes Mac users and those who favour free and open source alternatives to Microsoft Windows, such as Linux. The BBC Trust has told the corporation it must widen the access to iPlayer as soon as possible and has ordered a review every six months. The trust met with Mark Taylor, the head of the Open Source Consortium and one of the more vocal critics of the Microsoft-only launch, earlier this week. "They reiterated their commitment to platform neutrality, specifically mentioning Linux, and welcomed our offer of help to establish a cross-platform approach," Mr Taylor said. The OSC is due to meet BBC management to discuss the issue further. According to Screen Digest data, online TV services are set to explode in the UK. In 2006 it estimates that 520.2 million pieces of content were streamed, of which the vast majority were free-to-view. It forecasts this will leap to 2.3 billion by 2011. The BBC currently dominates the free-to-view content market with 80% of clips originating from the corporation, according to Screen Digest. This will fall to about 62% by 2011, as video content becomes more widely available from alternative sources such as Sky. Mr Amel thinks there is a more general problem with the way the BBC and its rivals have decided to make content available. "Having to download a separate application for each service is a big problem and is a bit like having to buy a set-top box for every channel you want to watch. If you download all the applications that are available then that is using a lot of processing power," he said. He thinks providers might have been better to follow the model US networks have favoured where content is downloadable directly from their websites. Content currently available on PCs would also need to migrate to the TV, he said. Freeview boxes with internet connections are coming on the market in the next six months and could go some way to solving this problem. "The real holy grail in the UK is one platform, like the iPlayer, that brings all the content in one location - a kind of Freeview concept for downloads," he said. The BBC has said it is working with Virgin Media to launch on cable later this year.